Once or twice a week, I get gentle (and sometimes not so gentle) comments or emails from readers, asking me, in one way or another "Why do you do everything the hard way?!?!" 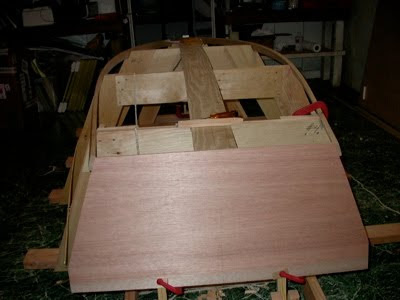 An easy answer would be, because my goal is not just to build a boat, but to learn how traditional wooden boats are put together, so I can maintain a larger wooden boat, such as the Blue Moon. 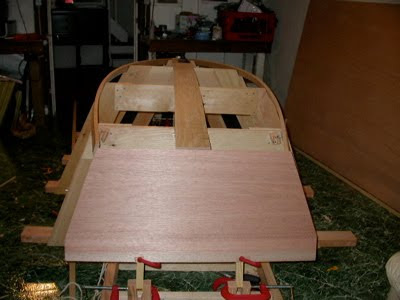 I have absolutely nothing against modern techniques like stitch and glue, but building such a craft (as attractive as one seems as my deadline looms), would not help me understand traditional wooden boat construction. But a fuller, more honest answer is that it's just plain fun to do something that is really, really hard. 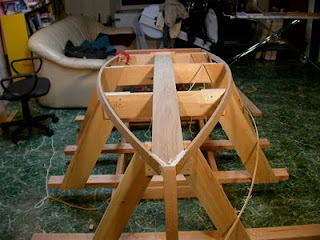 And make no mistake - traditional boat building is hard. So hard that Howard Chapelle famously said that every boat builder should have a 'moaning chair' that he can collapse into, moaning "How could I have been so stupid! ", or other despairing phrases. I actually haven't found much use for the proverbial moaning chair, but I do get much pleasurable use from my 'thinking chair'. And I certainly needed it yesterday, on Day 11 of my boat building marathon. The 3M 101 arrived from Jamestown Distributors arrived on time and I quickly put it to use bedding the stem, keelson, and chine logs in Cabin Boy's bow. I then bent the two chine logs into their notches in the forms, and screwed or clamped them in the stern, using the small blocks I'd attached to the forward side of the Station 4 form. This is when I received a rude shock. At the back of the boat, the chine logs did not seem to line up correctly. Photo #1 -- Major whoops? If you look at the upper right and left corners of the transom, you will see the ends of the chine logs sticking out on both sides. This is bad. And not just a little bad, but major league bad. The correct place for the chine logs to end is just inside the transom... ideally, right in the corners of the transom. They must be inside because the planking needs to fit over the chine logs and attach directly to the sides of the transom. Obviously, that can't happen with the chine logs sticking so far out of their assigned place. Now, I'm sure experience boat builders can diagnose the problem with one glance at the photo above, but even after taking this photo, I had to retire to my thinking chair for a good long time. Were the forms too wide? Is that why the chine logs were too far out? Or did I cut the transom (my precious piece of solid mahogany!) too small? Or perhaps the transom was not in the right place. Maybe if I moved it back a bit, the lines of the chines would converge correctly... but that meant I'd have to scarf additional lengths onto the chine logs and keelson. Why had I cut them off with such flair and confidence? For any of these problems to be the cause, one or more of my measurements would have to be way off, I thought. So I got up out of my thinking chair and started checking various measurements against the lofting. And the width of the Station 4 form was also correct. As were all the other station widths. And the width of the transom was correct, as well! In fact, all the measurements were correct. So why didn't the chine logs line up properly? I wish I'd actually looked at Photo #1, because the problem is acutely obvious in the photo (which I didn't really see until I sat down to write this blog), whereas it was not so obvious to the naked eye. But after a few more minutes in my thinking chair, I came up with a theory. What if I moved the blocks that secured the chine logs to the form from the front of the form to the back of the form? Would that make any difference? Indeed it did! If you study the two photos above, you will see that in Photo 1, the clamps on the forward side of Station 4 actually bent the ends of the chine logs outwards. 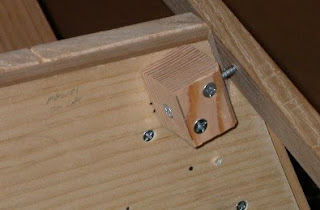 Whereas, in Photo 2, the clamps on the aft side of Station 4 properly bend the ends of the chine logs inwards. In Photo 1, the lines of the chine logs are really distorted... they should form a nice smooth curve from bow to stern, as they do in the Photo 2. The chine log clamp needs to be hefty... lots of pressure on it. So, phew! Disaster averted. And I call this fun? You bet I do. Not only was the problem itself an interesting puzzle, but finding the solution taught me to trust my lofting, and also reminded me to be much more sensitive to the lines of my boat. If I had just looked at the lines of the chine logs, I would have seen how far they were being bent out of line. They don't call them 'fair lines' for nothing. If they look right, they probably are right. If they look bent and tortured, they are definitely wrong. Would it have been faster to build a boat without these blasted chine logs? Sure! Would I have learned as much as I did if I hadn't had to solve this difficult problem? Definitely not! And what do I call the intense feeling of satisfaction that I got from solving this problem?